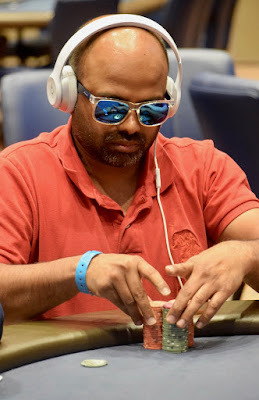 A short-stacked Raghuram Jonnalagedda moves all in preflop from the button and draws a call from both Sean Marshall and Ravi Udayakumar in the blinds. Both active players check down the T-J-A-T flop and turn, Udayakumar betting the Q river and eliciting a fold from Marshall. Jonnagaledda shows Queen_Jack for flopped middle pair.